Do you ever wonder why you love certain books, while others leave you wanting more? Every book needs to be strong in certain elements in order to capture…and hold your attention. For me, the beginning of a story – the hook that grabs me…and the ending of a story – the finish that leaves me feeling satisfied, are crucial. 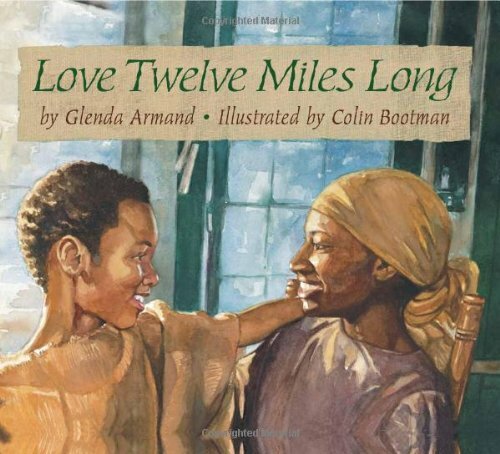 Love, Twelve Miles Long is a perfect example of a picture book that succeeds in both of these. This book stands out for many reasons, but the beginning absolutely grabs you. ’Can I come visit you?” asked Frederick. ‘By the time Mama slipped out into the moonlit night, Frederick was asleep. When he woke up early the next mmorning, Frederick ran outside and looked down the road he knew Mama had walked. Through his sadness he could still feel his mama’s presence. He thought about all the things she had said. This is a book that employs a circular pattern…the ending contains references that appeared in the beginning…and for me, that makes a truly satisfying story. I hope you all have a wonderful Sunday…I plan to stay inside because…guess what? IT’S SNOWING AGAIN!!!!!! So I guess it is a perfect day for reading more PICTURE BOOKS!!! This entry was posted in Beginnings and Endings, PB 14:14, Top Ten Picture Book Story Elements and tagged Christie Wild, Kristen Fulton's Mini-Wow, Love Twelve Miles Long, Story Elements: Beginnings and Endings, Writing tips by viviankirkfield. Bookmark the permalink. Hi, Vivian! LOVE, TWELVE MILES LONG is new to me. Thanks for sharing! What a sweet book! I’d seen it mentioned elsewhere, but yours was the first description of it that made me want to read it. Snowing here today, too… and this kind of weather does make great picture book reading days, doesn’t it? I think the best thing about participating in these challenges is finding out about so many great picture books you haven’t already read. This one’s on my library holds list now! I saw this book on Kristen’s website as well…and finished up my last three ideas today for the Mini-WOW. I need to have a box of tissues ready when I ready this one. Circular stories are great to help kiddos see how somethings come right back around from where they started…maybe without even knowing. Thanks for sharing. Haven’t read this one yet. Looks like a great addition to our US history curriculum, thanks! It is hard to keep track of all the wonderful books that come out…that’s what I love about these challenges…I’ve been introduced to a whole bunch of great picture books that I had not come across before. 🙂 Thanks so much for stopping by….this book touched my heart. My library doesn’t have a lot of books or a lot of new books. We can’t get any book we want. That’s part of why I started this challenge, so that hopefully, after reading each other’s “lessons/reviews” we can feel like we’ve already read the book and learned a technique from it. I’m so lucky, Christie…not only does my library not have a limit on the number of books I can take out, but they are also pretty good about getting everything I request from other libraries, if they don’t have it. What an awesome challenge this is…I’m so happy to be participating! Looks like a marvelous tender story if love Vivian. I must make sure my library gets this. I take them lists and as they can they order books I have requested. I’ve got to get this one from the library. It sounds so beautiful! I don’t know why I don’t get notices form Kristen’s blog. I need to check on that. this is a new one to me. Sounds like a great book with good dialogue and a wonderful story. Yes, this one needs lots of Kleenex. It seems like a tear jerker, the best kind of story and hard to do in a picture book. I”m going to see if I can get it from our library. Like you I can put books on hold from our other libraries in the system. But if our whole library system doesn’t have it — well I”m out of luck.